usatoday Article about Mo Asumangs new documentary "The ARYANS"
The German filmmaker and U.S. president are kindred souls. Like Obama, Asumang, 45, was born to a white mother and black African father. Each was also were raised largely by a doting, white grandmother. And each, eventually, undertook a journey of self-discovery. 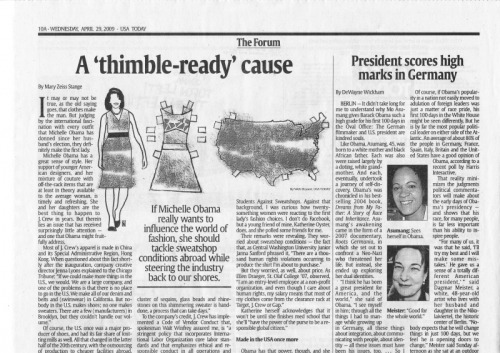 Obama's was chronicled in his best-selling 2004 book, Dreams from My Father: A Story of Race and Inheritance. Asumang's awakening came in the form of a 2007 documentary, Roots Germania, in which she set out to confront a Neo-Nazi who threatened her life. But instead, she ended up exploring her dual identities". 4 x Harald Schmidt Shows, J.B. Kerner, Beckmann, Hermann & Tietjen, Biolek, Zimmer frei, Volle Kanne, NDR "DAS! ", WDR west Art, Promi Dinner, Sat 1 Frühstücksfernsehen, several MTV Shows, Viva,several TV Magazins (kulturzeit, Leute heute, aspekte ....) and Shows….etc. "Brunhild with Afro-Look......Riskily Roadmovie.....Esoteric Cross-over-trip". 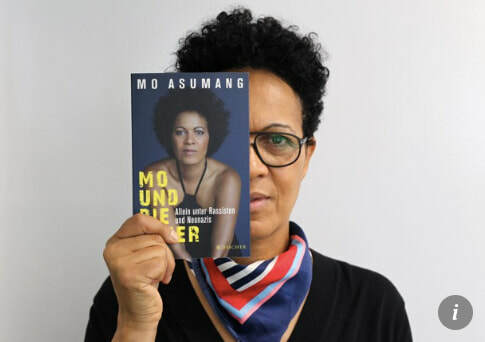 "Der Rassismus sitzt in der Mitte der Gesellschaft"
"You can call this woman brave: TV-presenter Mo Asumang ("Liebe Sünde") met with those people who would like to see her dead". 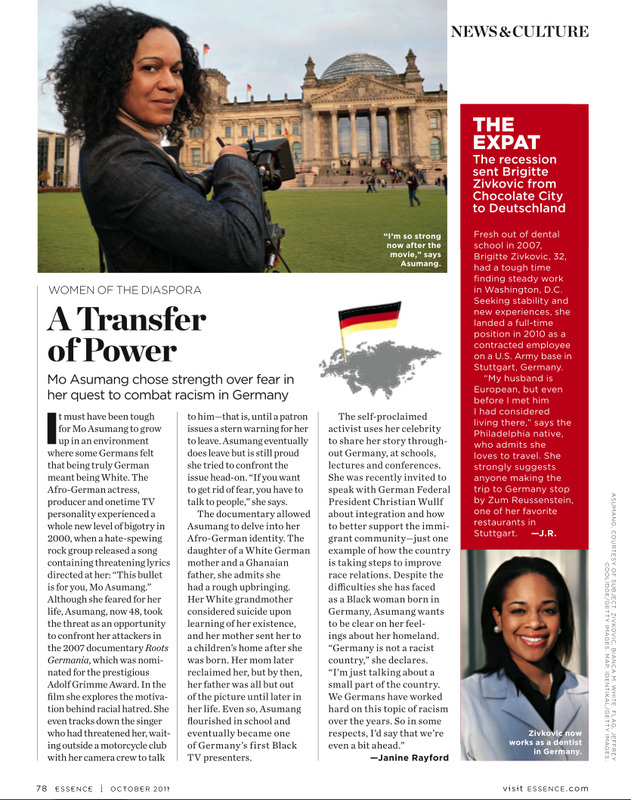 Mo Asumang (Director) was the second black German TV Presenter in Germany 1996. She started her career as a first league basketball player in Germany with her deep voice she then studied Classical singing and worked as a voice actor for film dubbing for TV series and movies such as Independence Day, Cold Case, Heat, Startrek Voyager. The German channel Pro 7 gave Mo the chance to present the TV Magazin “Liebe Sünde”, in which she talked about love and relationship to an audience of around 2,5 Million people. Mo Asumang presents the movie in the media as well as schools and universities, leading lectures about her journey and workshops about topics such as racism and integration.